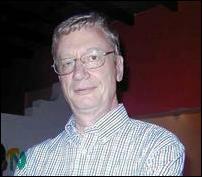 German ambassador in Sri Lanka, Mr.Jurgen Elias. A closing event was held during the weekend at the conference hall of the Uppuveli Provincial Guest House in Trincomalee. The Ambassador for Federal Republic of Germany in Sri Lanka, Mr. Jurgen Elias, graced the occasion. The IFSP was launched in the Trincomalee district in 1998 August at a time when the Government of Sri Lanka and Liberation Tigers of Tamil Eelam were engaged in war. The Chief Secretary of the North East Provincial Council, Mr.S.Rangaraja, said at the closing function that the IFSP started its humanitarian activities in the Trincomalee district five years ago when people got displaced and faced immense suffering due to war. He said that the IFSP was not a donor agency but it was an implementing agency of the Federal Republic of Germany. He commended the services rendered by the IFSP to the people of the villages, which had been badly affected by the war at a critical time. The IFSP had been supporting people at food risk and affected by the conflict since August 1998. The objective of the IFSP was to diversify and intensify the food and income sources and to improve the diet and health care, sources said. Under the IFSP programme, 560 village development projects in 170 villages located in nine divisions were completed. About 25 % of the population of the district was directly addressed and approximately 65 % indirectly. A total sum of 400 million rupees was effected locally. 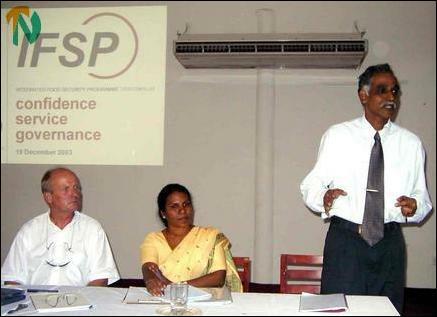 The IFSP in Trincomalee was a factor in the district’s economy with respect to procurement of goods and services and employment, according to a report submitted by the Development Economist and Team Leader of the IFSP, Dr.Dedo Geinitz, and the IFSP Project Director, Ms. Rohini Singarayer. The report gave detailed account of the physical progress of the IFSP programme. It said that 260 km rural roads and 50 minor tanks were rehabilitated and developed; storm water drainage and irrigation channels and structures were constructed, cleaned or rehabilitated. 380 low cost houses for returning internally displaced families were constructed. 13 schools and pre-schools were constructed or repaired and one agrarian service centre was reconstructed. In the health sphere, a school feeding programme benefiting about 8,000 children in 60 remote villages was implemented. 1585 toilets and 75 wells were constructed. Regular de-worming and immunization campaigns had addressed 35,000 school children. A village health team and village health committees were activated, the report added. Home gardens and school garden programmes benefited thousands of families. Coconut cultivation was revived, the report said. The report further said when the IFSP programme was launched in Trincomalee district in 1998, the Trincomalee district had a high incidence of malnutrition: 51 percent of the children below five years were underweight, 27 percent stunted and 26 percent suffered from wasting Almost 50 percent of all women showed severe signs of malnutrition and more than 75 percent of the population depended on state support. Agricultural had drifted into subsistence farming. 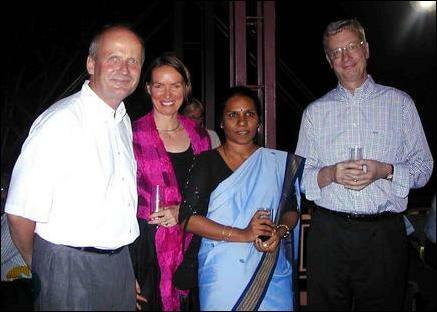 ( L- R ) Dr Dedo Geinitz, his wife, IFSP Project Director Ms Rohini Singarayar and Ambassador Mr.Jurgen Elias.